Let C-Line’s sorter do the work for you! The sorter helps accounting professionals track when invoices are due or bills paid by utilizing the numeric dates (1 – 31). Teachers can organize homework and tests alphabetically throughout the week, making it easy to hand-out graded assignments on Friday. This organization tool can even be used at home for keeping track of household bills; organizing the documents by month will make it easier to reference them in the future.This durable plastic sorter is specifically designed for left-handers, so that you can sort and file more efficiently. 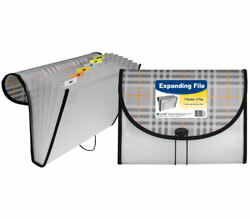 Organize and group documents with one dimension of 9 ½ inches or less. Conveniently stores in a standard desk drawer. Dividers are labeled from A to Z, January to December, Sunday to Saturday, 1 to 31 and 0 to 30,000.